1. 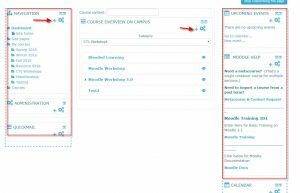 Once you have logged into Moodle, you will be taken to your Moodle home page. 2. To Customize the Page, click Customise this page in the upper right corner. 3. You will then see a series of editing icons. 4. 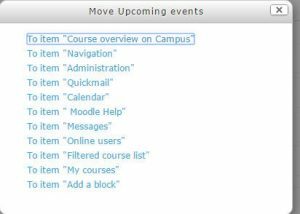 You will then have the ability to move or add Blocks to your Moodle home page. 5. To add a Block, click the drop-down menu under Add a Block, and select an item to add. 6. To Move a block,click on the move icon and drag it anywhere you want to move it. You will then see dotted black lines indicating where that block may be relocated. 7. If you simply click the Move icon, you will see a list of locations to where you can move the block. Choose the location and that block will be relocated to that location. 8. When you are finished editing, click Stop customising this page in the upper right corner.